A color palette is a collection of 256 colors designed for easy selection. 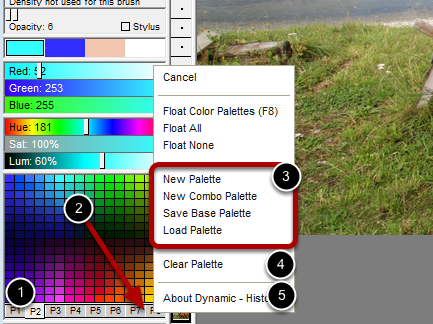 Up to 8 color palettes can be loaded into the palette tabs. Right clicking on the tab position will bring up the popup menu. Palette management options exist here. The Clear Palette menu item will clear the current palette to all white. The About menu item will display the credits for the palette.